Remember I told you I had plenty more posts about the Row by Row quilt I did?! Well, I wanted to expand a little on fusible web appliqué. I use a product called “Softfuse.” You want to make sure whatever you use is meant to be stitched through, and I like Softfuse because it doesn’t feel like cardboard when it’s fused together. Most appliqué patterns come with 2 parts: a page of items to trace (usually reversed since the fusible web is applied to the back of the fabric) and a layout page so you can get the pieces put together correctly. I trace the outline of each piece using a sharpie (use black and not colors!). Then I cut roughly around the shapes arranged by color. I fuse these to the corresponding fabric with a hot iron. Then, I turn on a good tv show and cut, cut, cut. I use a nice pair of scissors made for detailed fabric cutting. I splurged on them at Joann’s (with a 50% off coupon!). There was enough cutting for this quilt that my hands got a little crampy. Actually I just realized I had told someone (in a self-deprecating way) “eh, yeah, you just iron these things on…” Geez, I should have remembered how my hands felt when I trivialized the amount of work I put into this! 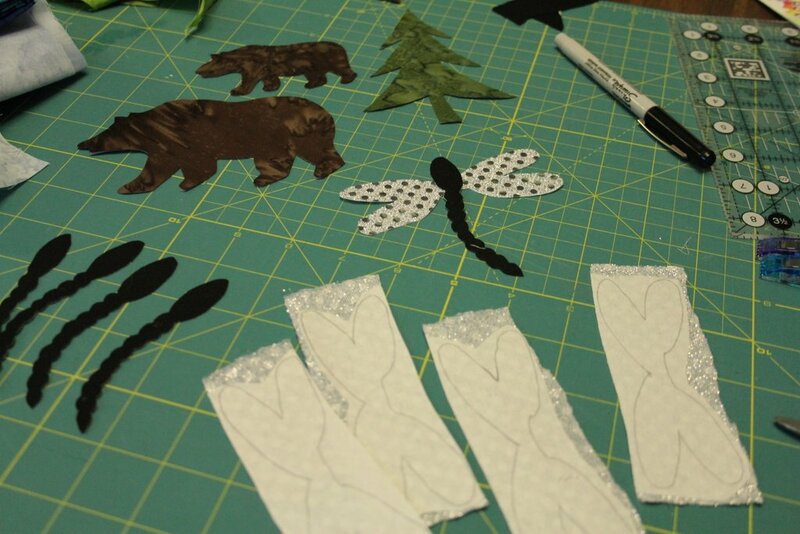 So here’s a shot from one of my cutting sessions– you can see my fine point sharpie, some bears, a tree and some dragonfly bodies I had already cut out. The dragonfly wings are waiting to be cut. After everything’s cut out, you fuse it to the background fabric! Softfuse is soft but it doesn’t seem to hold up to much abuse, so you definitely should sew it down. I used an invisible thread (filament) for most of the blocks but I didn’t sew everything down. I kind of wish I had but I can always do that later if it bothers me. 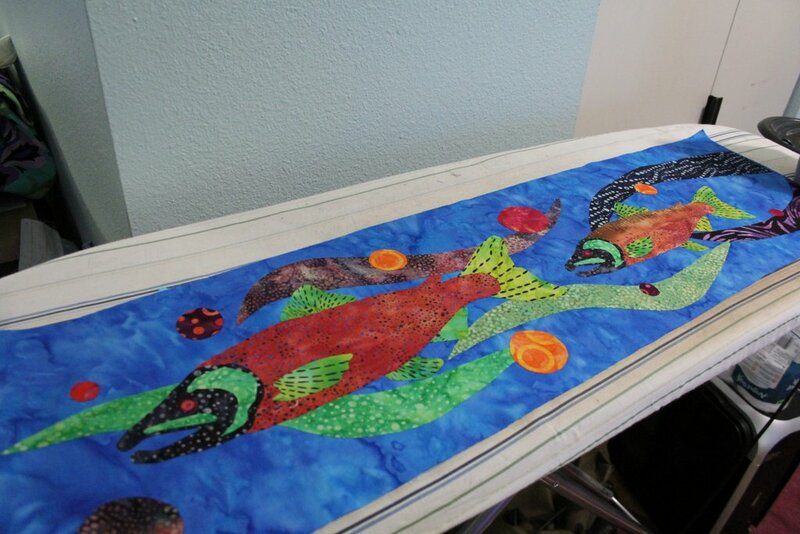 For now the quilt is hanging in my office! It makes a very colorful decoration!